Where do Deer Flies Live? Is there a “Deer fly Season”? As anyone who has ventured into the woods can tell you where deer flies prefer to hang out. Since they lay their eggs in mud areas near water, swamps and wet lands are some of the worst spots to get bit. That said, they also make themselves at home around livestock, campgrounds, and open fields – anywhere there's a meal nearby and somewhere to lay their eggs not too far away. Deer fly season peeks in June/July in most of their range. They are common throughout most of the United States and Canada. Do all Deer Flies Bite? Deer flies are also called a Marsh Fly, Sheep Fly, Yellow Fly, Pine Fly, May Fly, and Salt Marsh Greenheads. Whatever you call them, they're annoying. The females are the guilty parties. They're after your blood, and their bites really itch. The males feed on pollen and nectar from plants. Deer flies tend to go for the head and upper body, whereas horse flies like to go for the legs. 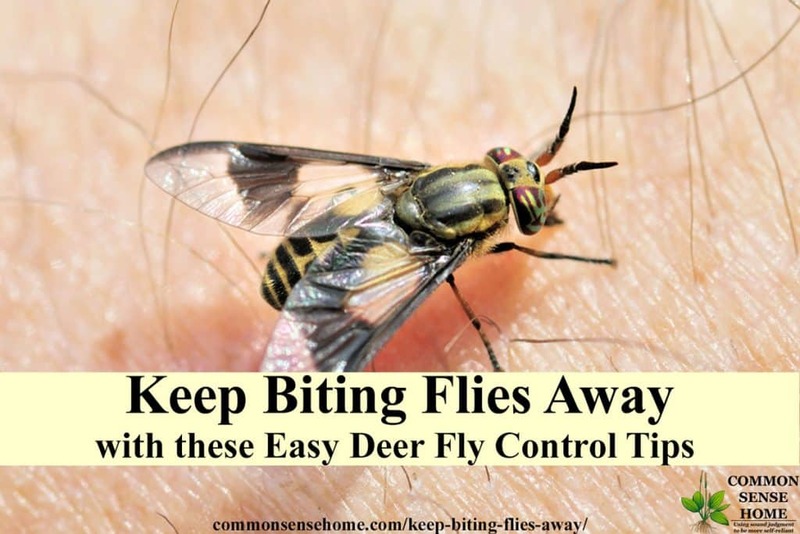 Deer flies are about 1/4″ to 1/3″ (6 -8 mm) long. Horse flies are about 2-3 times the size of deer flies. Like mosquitoes, deer flies are attracted to carbon dioxide from breathing, warmth, motion and darker colors. 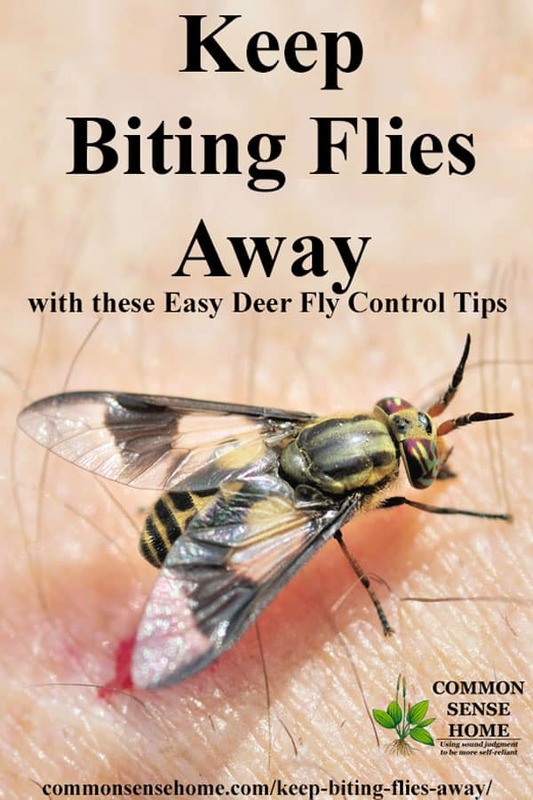 Deer fly saliva contains an anti-coagulant, which means the bites keep bleeding for a while. Those who are allergic to anticoagulants can have a reaction to deer fly bites. The bites will swell and itch, so it's important to keep kids from scratching to prevent secondary infections. Check out 15 Home Remedies for Bug Bites and Stings for treatment tips. My youngest complained about deer flies every time he mowed the yard. The deer flies dive bombed his eyes and circled his head. A while back my husband told me a story about when he was a Boy Scout. They were traveling through a swampy area in Canada, being plagued by deer flies. Their guide plucked a muddy fern and set it on top of his hat. The flies started circling the fern instead of his head. The rest of the troops followed suit, and they were one their way without flies in their faces. We're short on ferns around here, but do have peacock feathers. I took my son's hat, a little duct tape and a couple of feathers, and set him up with his own personal deer fly deterrent. Deerfly patches stick onto your hat to trap the little buggers, and larger sticky traps for deer flies and other biting flies to keep near your barn, stable or campsite. The patches might also work well on a pant leg or wrist if the flies are really bad and going after any exposed skin. 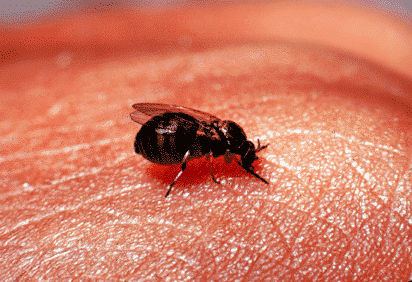 This year (2018), there's been an extreme surge in the population of small biting black flies (also known as buffalo gnats or turkey gnats) in many areas. My friend, Joy, of Adventure Acres, was hard hit with buffalo gnats on her small homestead. She checked on her chicken flock at night and all was well. The next day during morning chores, they found many chickens dead. Some died from inhaling the gnats, others seemed to have died from an allergic reaction to the number of bites received. The gnats were mobbing the chickens, biting every exposed surface, even working under the feathers to bite. Although she knew gnats were in the area, they have never had a problem like this before. Joy's grandfather noted that he had not seen so many gnats in the 90 years that he has lived in the area. To save the rest of the flock, Joy mixed up a vanilla spray gnat repellent with three parts vanilla and one part water. She sprayed this on the chickens and around the coop and yard. The results were visible – gnats left the chickens, even crawling out from under the feathers where they were hiding. You can use homemade vanilla extract if you have it. (Real vanilla extract is best because it's more potent, but imitation will do in a pinch.) Place the vanilla/water mix in a spray bottle and apply liberally to areas that you want to protect. Is there a biting black fly/buffalo gnat season? Yes, there is a biting black fly season where activity peaks for these little buggers. The worst of the black flies appear for a several weeks in late spring/early summer. Timing varies by area and weather patterns for the year. Remember, if you're a little slow with the fly repellents and you get bit, we have help at 15 Home Remedies for Bug Bites and Stings. Originally posted in 2012, updated in 2017, 2018. Neat idea!!! I get bit by those nasty buggers when I walk along the canal – they HURT! I gotta find me a feather or a fern! You want to know the funniest part? I was going to use some other words (I can’t remember what at the moment), but I didn’t want to spell it wrong, lol. Oh, I just noticed you changed it!! lol! Yay! This is great info, as always! We will put this to use. Thanks! Wanted to also let you know the lotion bar link isn’t working. Or maybe just not for me. Thanks, Heather. I just added a new link that should work better. 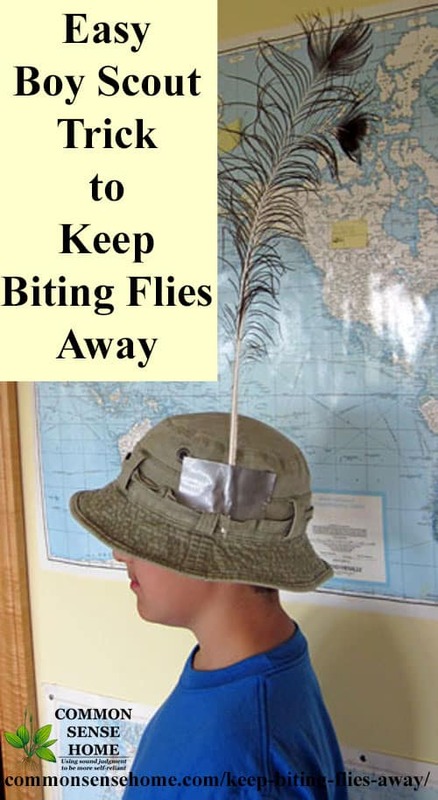 I dont even use a feather the bucket hat works well on it’s own to keep the flys out of the face. The bucket hat also keep long hair from being grabbed by trees. Putting your hand above your head works too, but can only hold it up so long. I’d vote for a stronger topical bug deterrent, especially given that you’re allergic, possibly something with an essential oil blend like Terrashield, or citronella and mint. If you get bit, do your best to get a poultice on it immediately to pull out the toxins and reduce inflammation. My favorite go to for bites and stings is common plantain. It’s worked wonders for me. You might also want to check out the post on Home Remedies for Bug Bites and Stings. I wonder if you could try something similar for horses? Ever since the weather warmed up this year, when the kids and I go riding, the deer flies and horse flies swarm us! Even when we use spray on the poor horses, they get bit over and over. It’s worth a try. Maybe something mounted on the pommel and something on your hat? Interesting..I wonder if that’s not the original reason the Native Americans (and others) wore feathers & headdresses on their heads…and why many hats often have a feather in the hatband !? I collect my urine in spray bottles. Spray your lower extremities. This fantastic advice. I will try it tomorrow. I hike daily in a wetland and nothing so far has worked well. Deet, oil of lemon eucalyptus, icaridin. Permithrin is hard to get without additives in Canada, I have to wait until I can go to the US to get Sawyers version. Will Any type of fern work such as Kimberly Fern. They attack me & grandkids around my pool. Anything that rides above the head will attract the deer flies to that instead of you when you are upright. It’ll be of limited help when you’re sitting down or laying down. Hi Laurie! Love your information. 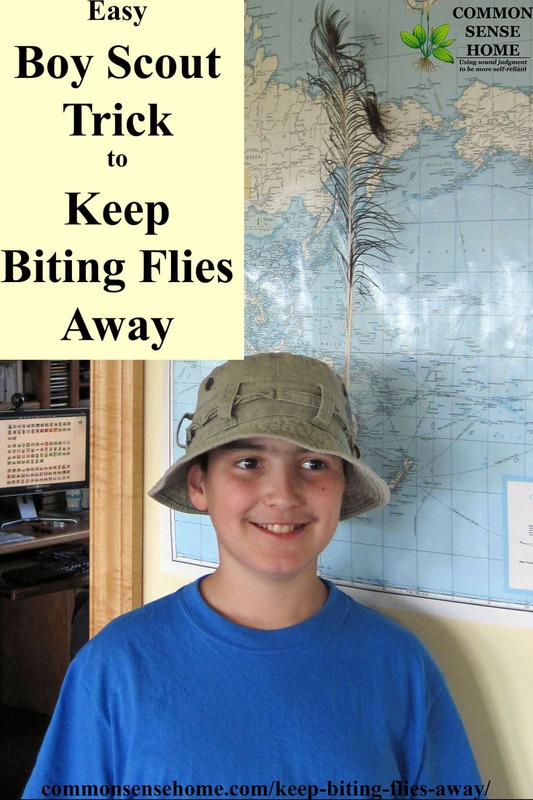 I have been Researching information about deer flies and horseflies online and found your site. I love that you provide information that is different from what the other sites post and not just the same thing over and over again. I have a question… I live in North Florida and I keep getting bit on the back of my legs and my ankles. I’m not sure if I’m getting bit by horseflies or deer flies because they are so fast and we have both here. Do you have any advice on how to identify which fly by the bite? Thankfully I haven’t been bitten by a horse fly, so I don’t have an easy way to compare them. The bite descriptions I’m finding are similar for both. Around here, we have both, but it’s been my experience that the deer flies are much more likely to attempt to snack on me. I’ll find the horse flies in barns, or stuck in windows of the coop. Thanks for sharing your tip, Randy. We do have some tips for ticks at https://commonsensehome.com/natural-tick-repellents/, but they tend to be persistent pests. Bugs that are attracted to carbon dioxide can be lured away by mixing up some yeast and warm water in a soda bottle. I add a little sugar to feed the yeast, they go in the bottle and drown. Experiment with essential oils, spiders hate peppermint oil as do mice. Ants hate citrus, you get the picture. Search Pinterest I have found a lot on there.